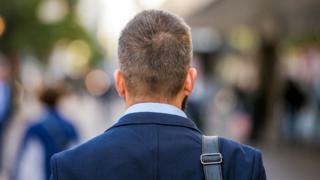 In 2017, there were 4,383 male suicides and the rate was 15.5 per 100,000 men - down from 20 in the late 1980s, data from the Office for National Statistics reveals. Although the male rate is falling, men still account for three-quarters of suicides in the UK. The Samaritans said recent efforts to prevent suicides had helped. The female suicide rate has remained stable for the past 10 years. Ruth Sutherland, head of the Samaritans charity, said the figures were "encouraging" but "every death was still one too many". "We believe that the focus in recent years on suicide prevention to tackle the higher rates in men has contributed to this," she said. "Added to this, reducing stigma around men's mental health and encouraging men to open up and seek help when they are struggling has been beneficial." The charity said suicide affected the most vulnerable and disadvantaged people in society. Men aged 45 to 49 are the age group with the highest suicide rate, of 24.8 deaths per 100,000, the ONS figures show. Ruth Sutherland said: "We must all continue to target expertise and resources at preventing men from taking their own lives and to reduce suicide across the board. "We need to work harder at understanding who is taking their own lives and why, and what support and interventions work to save lives." If you are struggling to cope, you can call Samaritans free on 116 123 (UK and Ireland), email jo@samaritans.org, or visit the Samaritans website to find details of the nearest branch. BBC News - Can suicide rates be reduced to zero?